The second edition provides more than 45 of the computational and statistical procedures most often used to evaluate drug action and safety in experiments on animals and humans. 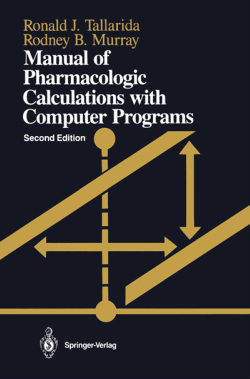 Included are quantitative procedures and corresponding computer programs for the most important pharmacologic calculations--graded and quantal dose-response relations, relative potency, drug antagonism, Scatchard analysis, pharmacokinetics, statistical routines, and much more. The pharmacologic basis underlying every computation is clearly presented, along with mathematical formulas and worked examples. Each procedure also includes a visual guide to facilitate computer input and interpret output. Students, researchers, clinical pharmacologists, and pharmacists will find this book and accompanying software an invaluable aid. The second edition offers expanded coverage (14 new or revised procedures) an improved format and improved computer programs that run on popular computers. From the reviews of the previous edition . . . Each program is concisely written and clearly documented with complete BASIC listings . . . programs can be readily separated for implementing on machines with very modest capacity. In brief, this program set can be regarded as adaptable for divers automatic calculating devices. - Journal of Clinical Psychopharmacology.